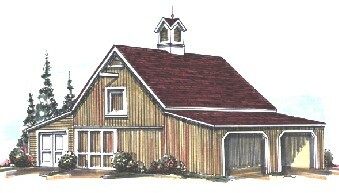 This efficient barn has two big parking bays, room for a work or hobby shop and a 12'x24' side shed for firewood, lumber, yard tools, small tractors and more. The center bay has 9' high and 10' wide doors front and back. You can drive your tractor, pop-up van, trailer or tall SUV right through. Enclosed Floor Area: 768 Sq. Ft., Shelter Area: 288 Sq. Ft., Loft Area: 420 Sq. Ft., Ridge Height: 20'-4"